Do you LOVE chocolate cake? I have yet to meet someone who doesn’t. And I get a TON of requests for vegan and gluten free chocolate cakes or pastries that taste the same as traditional cakes, so I went on a quest to create the chocolate vegan gluten free madeleines of my dreams. And voilà here they are. Really! These are delicious and so easy to make. They are like that little black dress that you can dress up or down. The texture is just perfect. 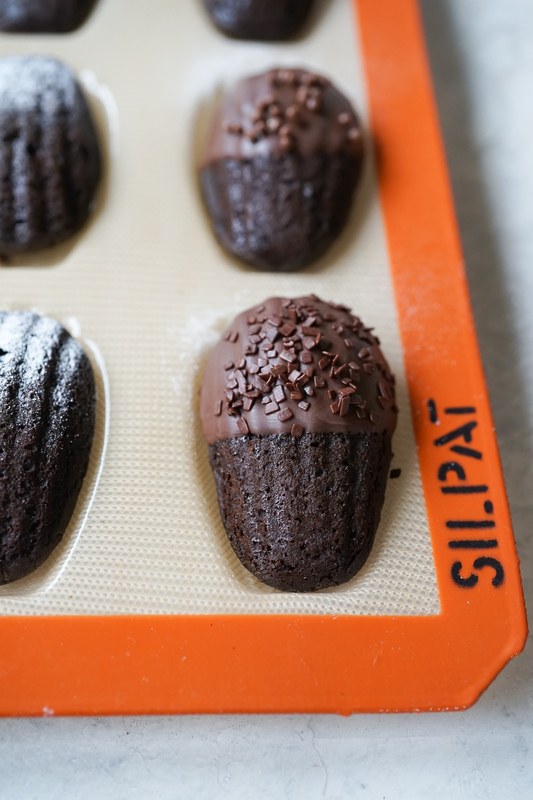 I developed this recipe for one of my favorite brands: Flexipan for their launch of their new line of Silpat molds they made exclusively for Williams Sonoma (they are beautiful and very functional). Thanks to Flexipan by Demarle for sponsoring the molds for this recipe. This recipe is a perfect example of how important a well balanced recipe is: and how great baking is all about proportions. Plus this chocolate glaze is the bomb! And it’s a timeless recipe I learned from one of my favorite Pastry Chefs: Sarah Kosikowski from Valrhona. Save this glaze recipe because it is the perfect back pocket recipe and you can have it made beforehand. It is life changing. Soft, moist, tender madeleines that are seriously divine! Plus they are vegan and gluten free and low in sugar! Over the Summer we visited Waco Texas home of Magnolia Market and Magnolia Silos bakery and the city that the fixer uppers: Joanna and Chip Gaines have taken to another level which was a total #bucketlist for me. I spent all last year in the Real Estate industry looking for my baking school and became obsessed with watching every fixer upper show on TV (and I rarely watch TV) so living the Waco life for a day was awesome! I highly recommend the visit! 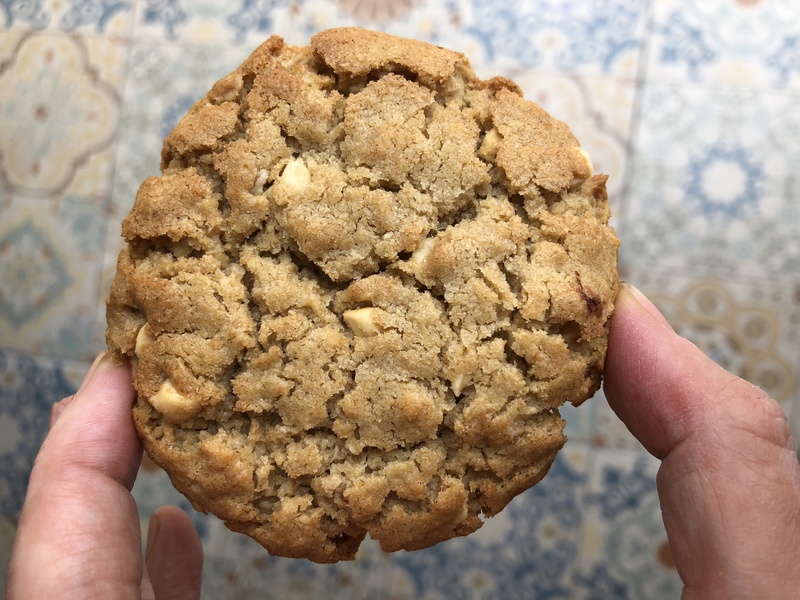 The best part of Magnolia Silos Bakery were these peanut butter gluten free oat cookies which where by far better than any other pastry in the bakery (I tried many) and are even better than any “traditional” peanut butter cookie I have ever had. And I don’t say this lightly because if you know me you know that I go to a lot of bakeries! So naturally I came back home and IMMEDIATELY wanted to recreate this cookie as soon as we drove back to Austin it was that life changing. So after making 4 really bad attempts and failing miserably at the texture and proportions I had to let it go (that seems to be my strategy for when things don’t go well: I surrender and let go: for a while..). I then went to Mexico City to visit my Dad and teach 12 classes and workshops and since I had 7 awesome assistants and we had time and a lot of amazing ingredients we made the a killer recipe and I am thrilled to share it with you today. And I apologize in advance as my sharing of recipes is not that consistent as I want it to be but that is my creative process (plus I do a lot of other events, classes, collaborations that take time). So enjoy! This recipe is worth gold. And it’s not that “healthy” but a delicious alternative indulgence for those who can’t or don’t want to eat gluten. Just don’t say anything just make them and share! 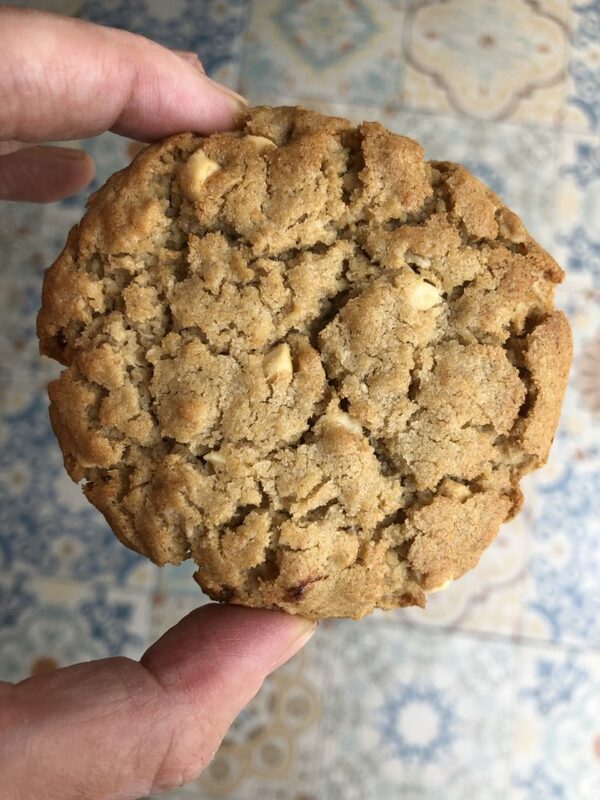 A chewy peanut butter oat cookie that will change your life regardless if it's gluten free! My personal favorite! 100 grams peanut butter (I love Trader Joes Valencia peanut butter most of all). Preheat convection oven to 350°F. Line a baking tray with a Silpat. Sift flour, baking powder and salt. In the mixer with a paddle, mix butter and sugar just until combined. Add egg, vanilla and mix well. Add oats and milk and mix well, add peanut butter and mix until combined. Add the sifted flour and combine just until incorporating—add the peanuts—mix well. Use a #24 Scoop and place the cookies onto the prepared cookie + flatten lightly onto the tray leaving enough room between them. Sprinkle with salt. Bake aprox 12 mins. Time depends on your oven. Cookies should be golden and crisp on the edges and ​tender​ inside. Don't over bake! Remember cookies will continue to bake when you remove them from the oven as they sit on the hot tray. Let cool for about 10 -12 minutes, remove and let cool on a cookie rack or place on a perforated tray. Mix all of the ingredients in a bowl. Measure the appropriate quantity called for in the recipe. I am so excited to share this timeless banana bread (or cake) recipe with you all! We all love banana bread, (well almost all) and everyone has their own claim to fame recipe. When Tim, the CEO of Maskal Teff and I began talking about pastries made with teff, he was keen on a family banana bread with walnuts that his wife makes at home, so that got me inspired to fulfill his foodie dreams. So I became obsessed with creating a gluten free ancient grain banana bread and started baking batch after batch to create a recipe that highlighted the power horse benefits of Teff. 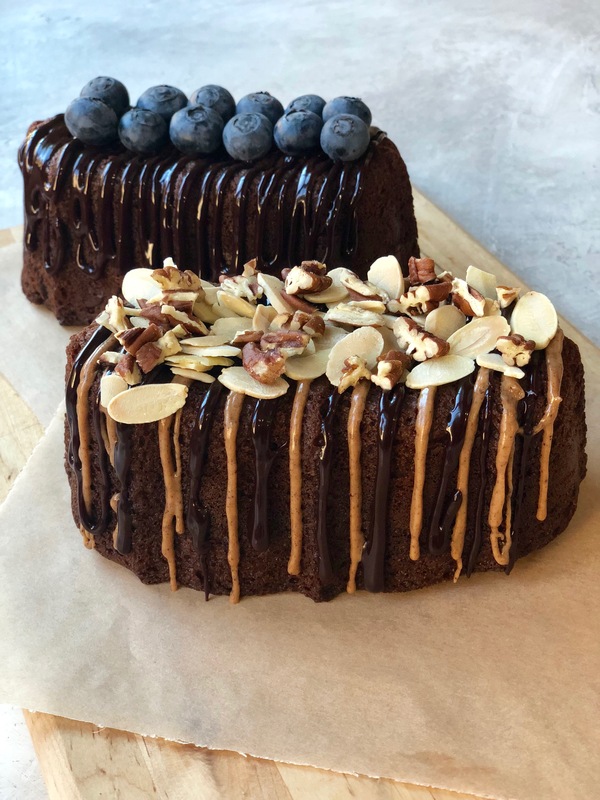 The goal was to develop a cake with a high inclusion of Teff that resulted in a moist cake without using complicated flours (no starches, no high glycemic flours, no gums either). I am a practical baker and I have always believed that the best recipe is the one you immediately want to bake and even sell. 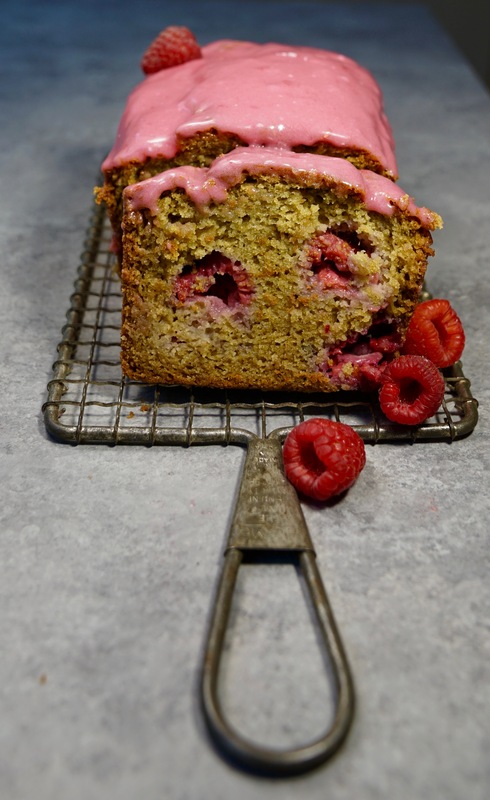 The best part of this recipe is that you can get all the ingredients in the supermarket and make a cake that really stands out as a timeless banana bread. I started to explore more of how teff flours worked in baking (in a high inclusion), and since I had already baked some previous recipes with teff (granola, brownies, vanilla cake), I knew through trial and error that this was not an easy task. Texture is such an important part in baking and even more so in healthy baking. There are 2 types of teff grains: ivory and brown: I personally love the Ivory flour most as it is easier to combine. So here is the secret tip of this recipe: (bring out your notebook!) I saw a banana bread recipe shared by Elissa Goodman where she combined equal parts of quinoa flour with almond flour and I thought just by reading the recipe what a brilliant idea! So I went and bought quinoa flour (I honestly could not remember the taste and texture of baking with it). I have been using sooo many ingredients lately. I made the recipe as is and did not like the taste of quinoa flour: it tasted like a moldy closet… but the recipe was a good start and I did love the idea behind it so I intuitively remembered my go to squash recipe (my version of Gjelina’s) and I recalled that a student made it with banana so I started playing with the flours and sweeteners like I do in my test kitchen. So here is the gold mine: don’t use teff 100 % it’s not a flour that can be used 1:1 meaning you can’t substitute 100 % of your regular flour with teff: it just doesn’t bake that well an tends to be grainy and dry your baked goods when you don’t balance it out with moist ingredients and I discovered through reading recipes online and comparing teff to quinoa (they bake similarly) that if you use half teff and half almond flour it works amazingly well, the texture is very smooth and it binds so well teff needs moisture and almond flour is the binding agent here. So the PRO tip here is substitute the flour in your recipes using ½ teff flour and ½ almond flour. No need to add gums or fillers! This cake only gets better with time! For those of you who are new to Teff (move over quinoa!) Teff is the new quinoa: it is the smallest grain in the world and it’s a perfect vegan protein. Teff adds a very interesting nuttyness to your recipes and it’s very versatile, once you start using it you will start opening your creative mind and discovering inventive ways to incorporate it into your life. When I have breakfast I look for great sources of fiber, protein, manganese, iron and calcium and teff is a nutritious power horse. This is a sponsored recipe and all opinions are mine. Don’t you just love this Vintage Nordic Ware Celtic Knot pan? I owned one years ago, I sold it to pay for pastry school and really missed it! I had a hunch to post a photo to see if any of my neighbors had one they didn’t want and since I have been on an “ask and you shall receive” quest I did and my dear neighbor Mary responded and we swapped her cake pan for my signature trail mix cookies! A win/ win! So here is the banana bread with my favorite superfood spreads from Sarais Spreads: maca almond butter, and the chocolate date spread from The Date Lady. Preheat the oven to 340˚F (this cake, like most cakes made with purees take way longer to bake and need to bake at a lower temperature, if you bake it at 350 F it will brown too much and get very dry and crusty on the outside and wet inside). Generously butter a 9x5-inch loaf pan + 1 mini loaf. Or you can make this in a Bundt pan or large savarin (which looks like a large donut). Whisk (or sift) together the flours, baking powder, baking soda, spices, and salt in a medium bowl. In a large bowl, whisk together the sweeteners, oils, banana purée, and eggs. Add the dry ingredients to the bowl with the wet ingredients and whisk until just combined. (Adding the dry ingredients to the wet ingredients helps to prevent little dry pockets in the bottom of the bowl.) Fold in the chopped chocolate or nuts if desired. Pour the batter into the prepared pans and bake for 70 to 90 minutes for the larger pan (15 -20 mins for the smaller please note time depends on your pan + oven) or until a skewer inserted in the center of the cake comes out clean. Let the cake cool in its pan on a wire rack for 20 minutes. Run an icing spatula or a thin knife carefully around the edges, and invert the cake from the pan. Re-invert the cake so that it is right-side-up and let cool on the rack for another 20 minutes. Transfer to a serving plate. Hey Buddy!, I found this information for you: "CHEWY HEALTHY BROWNIES – BETTER THAN BOXED BROWNIES". 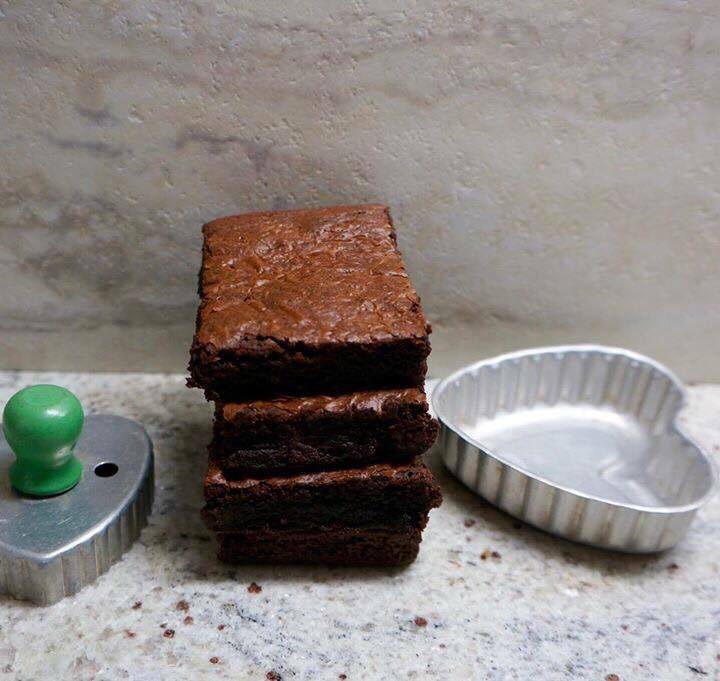 Here is the website link: https://www.vanessamusi.com/chewy-healthy-brownies-better-boxed-brownies/. Thank you.